In the adhesion assay, scientists hold a T cell and a target cell on micropipettes and move them together, so that the molecules on their surfaces interact and the cells “smooch” together. When the cells are pulled apart, the researchers can measure their deformation as a gauge of their stickiness. More movies of the assay are available in this 2011 Immunity paper and this 2010 Nature paper. The increased affinity after the peak of an infection could help the immune system hunt down mutated viruses that otherwise may escape, the scientists propose. 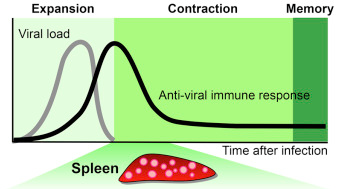 In mice, red pulp T cells were able to decrease viral load five times better than white pulp T cells. The differences in affinity appear to come from how the T cell receptor and its companion molecules are arranged within cell membranes. Interfering with cholesterol, a critical component of cell membranes, erases the differences in affinity, the researchers found. T cells are being harnessed as anticancer tools through immunotherapy, and a better understanding of T cell affinity could enhance those tools, as well as informing vaccine research, they note in their conclusion. Lab Land asked Grakoui whether similar affinity differences are visible in lymph nodes in addition to spleen, and he says that is an issue his team plans to investigate soon.